Noisy automotive brakes are an annoyance, at best. At worst, they can signal a serious problem with your vehicle’s brake system. Your local mechanic is always available to solve your most pressing automotive problems. However, the current state of the economy has many car owners tightening their belts and looking for ways to perform their own inspections and repairs. Finding the source of noisy brakes is possible with the right tools and enough patience. The following details what causes noisy automotive brakes and how to quiet them. Several issues can cause brakes to go from being relatively quiet to extremely noisy. The causes range from the relatively benign to the potentially dangerous. • Metal, brake dust or organic debris stuck on the brake pad can cause brake squeal as the pad comes into contact with the rotor. • Brakes using a harder metallic compound can squeal on occasions. • Wear indicators can come into contact with the rotor surface as the brake pad material wears down, causing brake squeal. • Warped or distorted rotors can cause brake noises, usually a grinding noise that indicates serious metal-on-metal contact. Noisy brakes can come with other serious issues, including a strong pull to either side upon braking and weak braking capabilities. It is important to address brake issues before they turn into big problems. Identifying which wheel houses noisy brakes can be tough to do. The best solution is to perform an inspection on each wheel. 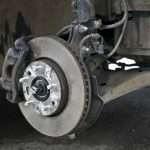 After safely raising the vehicle and removing the wheel, take a close look at the overall condition of the brake pads, calipers and rotors. The rotors should be smooth and groove-free; if there are excessive grooves and other damage, the rotors should either be turned by a professional or replaced altogether. Car owners should inspect the brake pads for excessive wear. If the pad material is down to the wear indicators, the pads should be replaced immediately. This can be done by unbolting the brake caliper from the rotor, popping the old pads out and inserting the new pads into the caliper. Owners should apply a small bead of brake anti-squeal to the back of the new brake pads prior to installation. Noise reduction shims can help reduce or even eliminate brake noise. These shims are installed on the back of the brake pad during pad replacement. The shims feature rubber padding with a metal backing in between, which helps isolate vibrations that could lead to brake squeal and other noises. Car owners can also cut down on brake squeal by washing excessive brake dust from their wheels. This will dampen the pads in the process and help prevent future build-up.